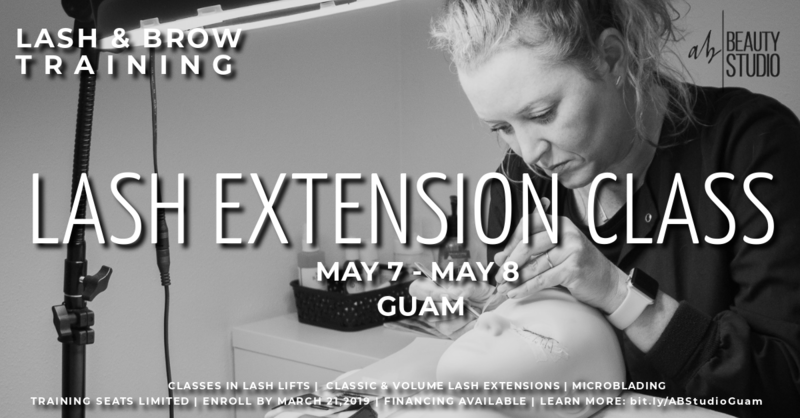 AB Beauty Studio is headed to Guam in May 2019 to do three days of intense classes in Lash and Brow Artistry. Enroll now as space in classes are limited. View Tuition and Course offerings below. Last Day to pay for classes. Based on Space Availability for Class. Students will be immersed in an intense 4-hour class on Lash Lift Technique, Sanitation and Customer Care. Training manuals and a Lash Kit good for 20 clients will be provided. Models: Students will be required to have two models attend a portion of the training. Model 1 should arrive at 10:15 AM and Model 2 should arrive at 11:15 AM during class. Training site: Agana Shopping Center. Enroll with Deposit, is a non-refundable 25% deposit to secure a student’s placement in class. This requires students to complete full tuition payment before April 31, 2019. Enroll in Full Payment, secures a student’s placement in class. Tuition will be paid in full. An 75% refund will be given if a student gives three weeks notice, in writing, of a reasonable inability to attend class, and if class can not be made up during the remainder of the training visit. Enroll with Financial Plan, secures a student’s placement in class and allows for interest free tuition payment installation, the first beginning with a 25% non-refundable deposit for the class. Financing will require a contract and agreement form for a student’s desired payment arrangment. The full course payment must be made by April 31, 2019. Requires student to email staff to begin payment. Students will be immersed in an intense 2 Day Class of Classic Lash Extensions and Introduction to Volume Lash Extensions. Students will learn Lash Extension techniques such as Mapping, Sanitation and Client Care. Training manuals and a Lash Extension Kit good for 20 clients will be provided. Models: Students will be required to have two models attend a portion of the training. A model will be needed from 2PM – 5PM on Aug 6 and Aug 7. Enroll with Deposit is a non-refundable 25% deposit to secure a student’s placement in class. This requires students to complete full tuition payment before April 31, 2019. Enroll in Full Payment secures a student’s placement in class. Tuition will be paid in full. An 75% refund will be given if a student gives three weeks notice, in writing, of a reasonable inability to attend class, and if class can not be made up during the remainder of the training visit. Enroll with Financial Plan secures a student’s placement in class and allows for interest free tuition payment installation, the first beginning with a 25% non=refundable deposit for the class. Financing will require a contract and agreement form for a student’s desired payment arrangment. The full course payment must be made by April 31, 2019. Requires student to email staff to begin payment. AB Beauty Studio’s Microblading Training Class is an intense two-weekend class. 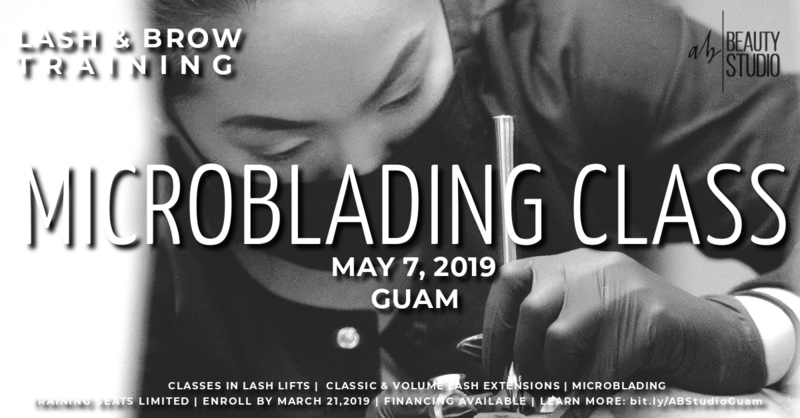 For the Guam Lash Brow Training Visits, we’ve segmented the Microblading course to offer Part 1 of the 3 Part Class during our May 2019 training visit, with Part 2 & Part 3 offered in our late Summer 2019 Advanced Training Visit. Part 1 During the May 2019 Training Visit, enrolled students will be immersed in theory, lecture and a live model demonstration. The 4 hour class will be cover topics of Technique, Sanitation, Client Care and Best Practices for Industry Standards.Theory Training manuals will be distributed during Part 1 Class offering. Part 2 & Part 3 During August 2019’s Training Visit, enrolled students will be immersed in hands on brow training, first beginning with brow mapping, stroke and color theory. Training Will be over 3 days, with 12 hours of class. Students will be expected to bring one model for their last day of class. Additional Training Manuals and a Brow Kit good for 20 clients will be provided. Enroll with Deposit is a non-refundable 25% deposit to secure a student’s placement in Part 1 of Microblading Class. This allows all students to attend Part 1 Training and requires students to complete full Microblading tuition payment before August 2, 2019. Enroll in Full Payment secures a student’s placement in class. Tuition will be paid in full. Students will be enrolled in Part 1 Training. An 75% refund will be given if a student gives three weeks notice, in writing, of a reasonable inability to attend class, and if Part 1 of Microblading class can not be made up during the remainder of the training visit. If a student is unable to make the Advanced Part 2 and Part 3 Microblading Class during the Summer Training Visit in June 2019, and training can not be made up during the remainder of the August Training Visit, 3 week’s notice is needed, in writing of a reasonable inability to attend class. Enroll with Financial Plans ecures a student’s placement in class and allows for interest free tuition payment installation, the first beginning with a 25% non=refundable deposit for the class. This allows the student to attend Part 1 of Microblading Training during the May 2019 Training Visit. Financing will require a contract and agreement form for a student’s desired payment arrangement. 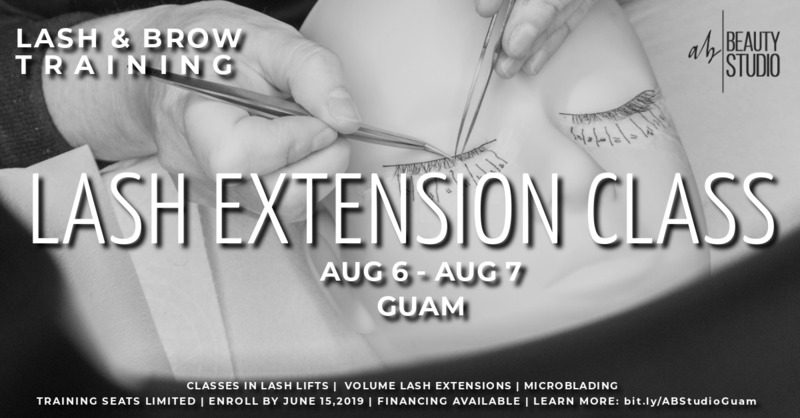 The full course payment must be made by August 2, 2019 to attend Part 2 & Part 3 of the Microblading class. Requires student to email staff to begin payment. 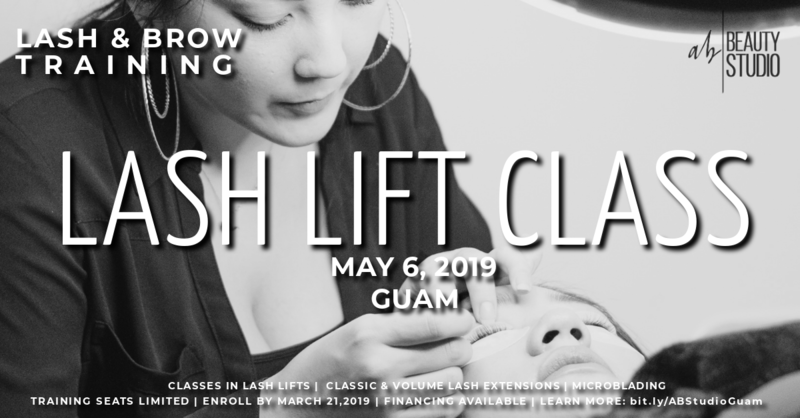 We’re returning to Guam in August 2019 to do three days of advance classes in Lash and Brow Artistry. Enroll now as space in classes are limited. Training site will be confirmed by June 15, 2019. Enroll with Deposit, is a non-refundable 25% deposit to secure a student’s placement in class. This requires students to complete full tuition payment before Aug 2, 2019. Enroll with Financial Plan, secures a student’s placement in class and allows for interest free tuition payment installation, the first beginning with a 25% non=refundable deposit for the class. Financing will require a contract and agreement form for a student’s desired payment arrangment. The full course payment must be made by August 2, 2019. Requires student to email staff to begin payment. 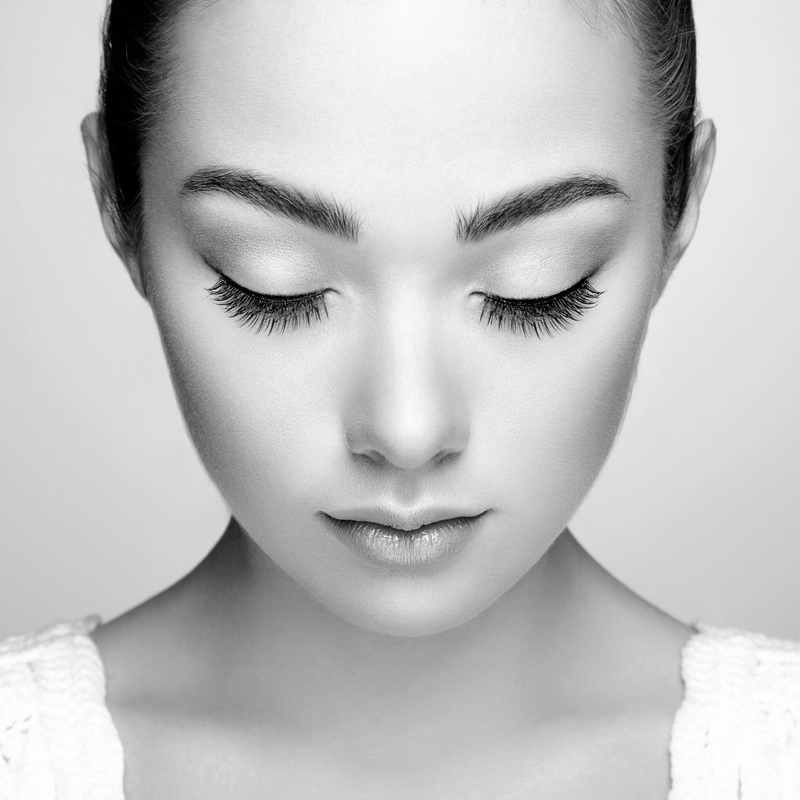 Students will be immersed in an intense s Day Class of Volume & Hybrid Lash Extensions. Students will learn Lash Extension techniques such as Mapping, Sanitation and Client Care. Enroll with Deposit is a non-refundable 25% deposit to secure a student’s placement in class. This requires students to complete full tuition payment before August 2, 2019. Enroll with Financial Plan secures a student’s placement in class and allows for interest free tuition payment installation, the first beginning with a 25% non-refundable deposit for the class. Financing will require a contract and agreement form for a student’s desired payment arrangment. The full course payment must be made by April 31, 2019. Requires student to email staff to begin payment. Models: Information will be provided to students via email. If a student is unable to make the Advanced Part 2 and Part 3 Microblading Class during the Summer Training Visit in June 2019, and training can not be made up during the remainder of the June Training Visit, 3 week’s notice is needed, in writing of a reasonable inability to attend class. Enroll with Financial Plans ecures a student’s placement in class and allows for interest free tuition payment installation, the first beginning with a 25% non-refundable deposit for the class. This allows the student to attend Part 1 of Microblading Training during the May 2019 Training Visit. Financing will require a contract and agreement form for a student’s desired payment arrangement. 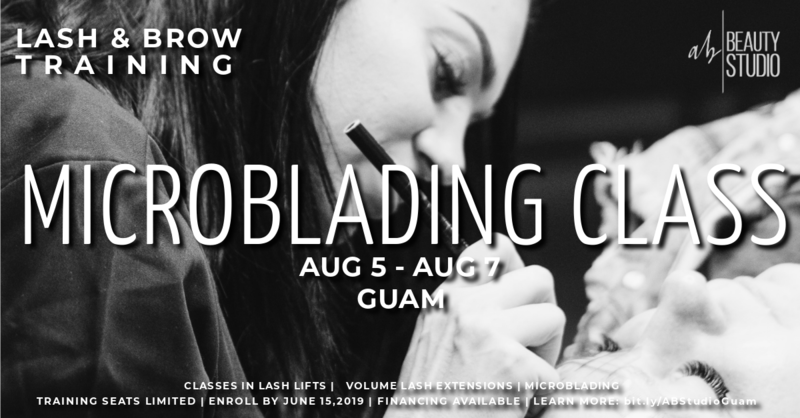 The full course payment must be made by August 2, 2019 to attend Part 2 & Part 3 of the Microblading class. Requires student to email staff to begin payment.